On Saturday I awakened at 3:30 AM, tiptoed out of the house as quietly as I could, and headed north and west to Sullivan County, the first of three counties I planned to visit in a series of surgical birding strikes to see (or hear) the birds I had thus far missed this year as they migrated through New York City. Sullivan County was my first stop because I was hoping to hear some of the secretive freshwater marsh birds that are often difficult to find. It was very shortly after five when I pulled up at Haven Road at the Bashakill State Wildlife Management Area and immediately heard an American Bittern busy “thunder-pumping.” My first target bird was checked off and I had barely even left my car! 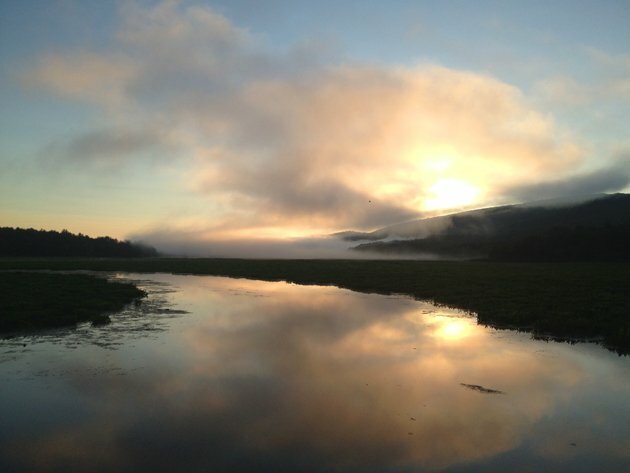 Not only that but the sunrise over the marsh (as seen above) was a wonder to behold. The next hour plus netted me a host of other species, including my two other targets, Virginia Rail and Common Gallinule. As always, the woods around the marsh were busy with breeders setting up shop. I particularly appreciated the Veery I heard singing, a bird you’ll hear in the video. In addition to the Veery I saw or heard a pair of Yellow-billed Cuckoos, some cooperative Eastern Kingbirds, Swamp Sparrows, Warbling Vireos, Wood Thrush, Cedar Waxwings, a Worm-eating Warbler, and, well, you get the idea: it was awesome! This video is obviously being shared here just for the sound. Not very exciting to look at, is it? I stopped back on Haven Road to see if anything else was around and I was pleased to be greeted by a pair of extremely cooperative Eastern Kingbirds. I spent a good fifteen minutes digiscoping them before heading to my next stop. 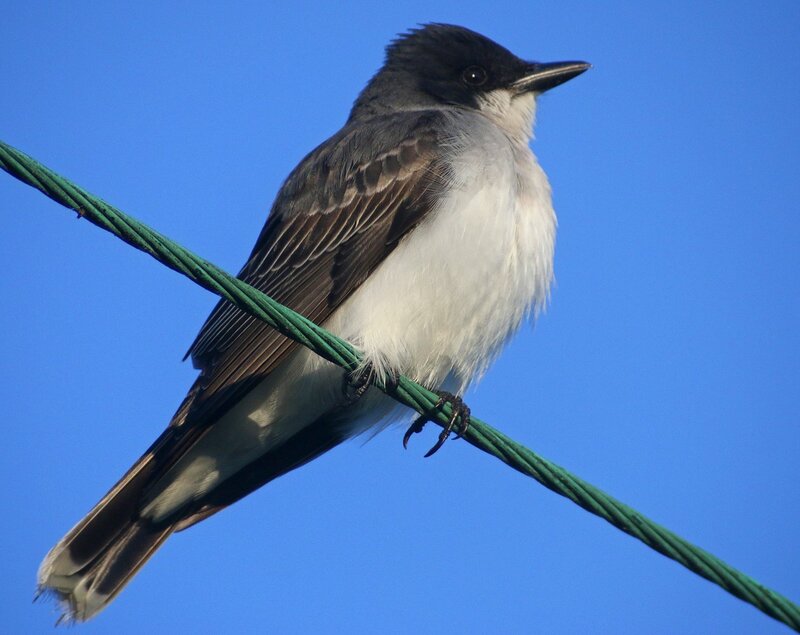 How can anyone not take advantage of cooperative kingbirds? 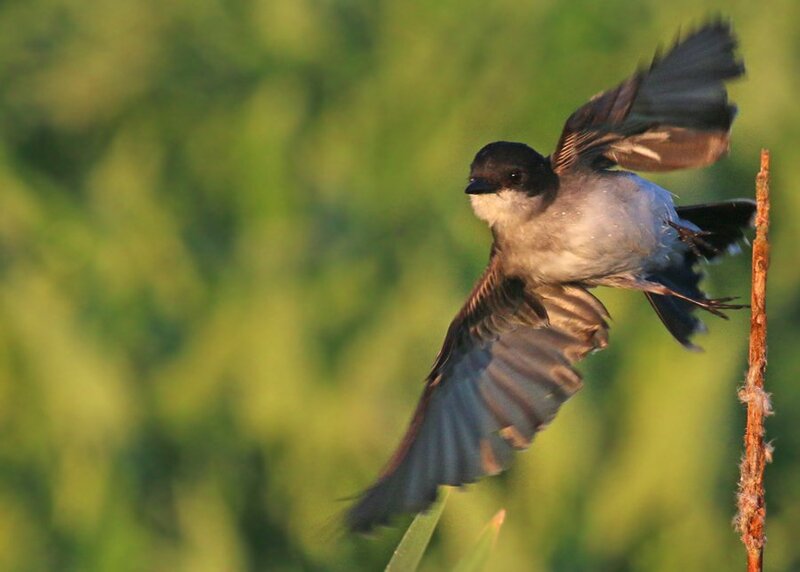 Eastern Kingbird taking off in pursuit of a bug. The tyrant of the telephone line. I swear, sometimes birds just like to show off. I said good-bye to Wurtsboro and headed east and then north, making my way to the Town of Wallkill in Ulster County, in particular, to Shawangunk Grasslands National Wildlife Refuge where I hoped to see Grasshopper Sparrows and other grassland breeders. I was amazed that there were two different birding field trips there already, but I managed to see past the tilly hats and spotting scopes to pick up not only my hoped-for Grasshopper Sparrows but Eastern Meadowlarks, Bobolinks, and Savannah and Field Sparrows too! 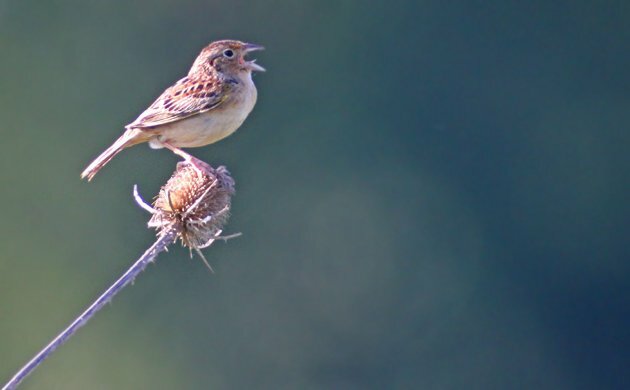 Grasshopper Sparrows don’t seem to sing terribly loudly but their song carries a long way. 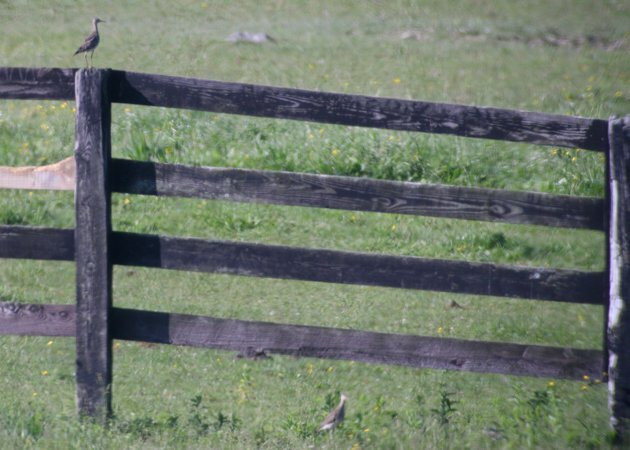 From Shawangunk I headed just down the road to Blue Chip Farm to see if I could find Upland Sandpipers. And, of course, because it was that kind of day, I did. The only downer was that they did not come close. Who likes a declining species of shorebird that eschews the shore and has as its most impressive vocalization a wolf-whistle? Me! This left me with one stop to make on my whirlwind birding tour. 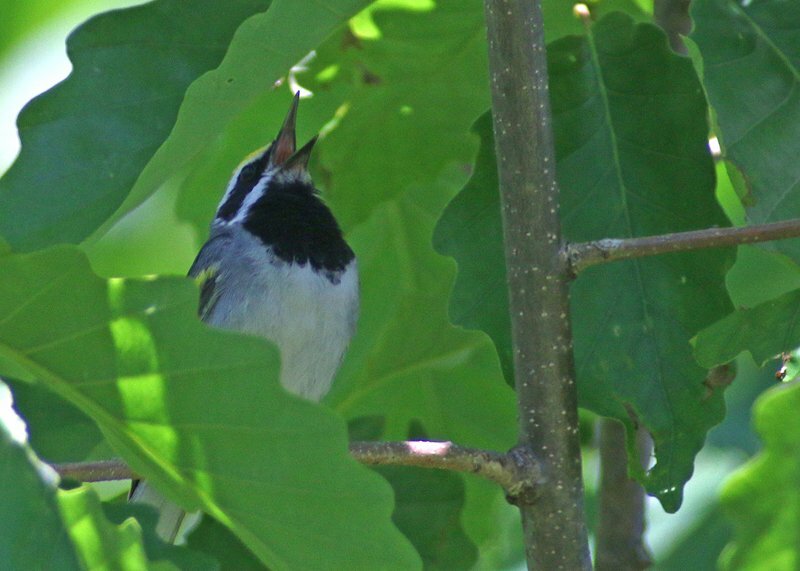 I had not yet found Golden-winged Warblers and Ironwood Road in Sterling Forest State Park was my best bet. Could I go six-for-six on my target species? Or could I do even better and pick up a Black-billed Cuckoo as well? Golden-winged Warblers ended up being embarrassingly easy, with four birds showing themselves to me, including this color-marked bird. But Golden-winged Warblers weren’t the only show-stoppers at Ironwood Road. A Worm-eating Warbler foraged in the forest, a Hooded Warbler sang from cover, Prairie Warblers were everywhere, a Ruby-throated Hummingbird did a quick fly-by, and, yes, shockingly, a Black-billed Cuckoo called several times! I was home by noon after what was undoubtedly my most successful search for some of New York’s coolest breeding birds ever! Holy smokes, what a morning! Thanks for posting the videos. No problem – I’m really getting into shooting video when the opportunity presents itself. And, yeah, it was one hell of a great morning! Wow! Awesome! ‘sounds like an ALFL in that GWWA video. Would you agree? It definitely is – one of the many good birds that were around Ironwood Road. What a great day! 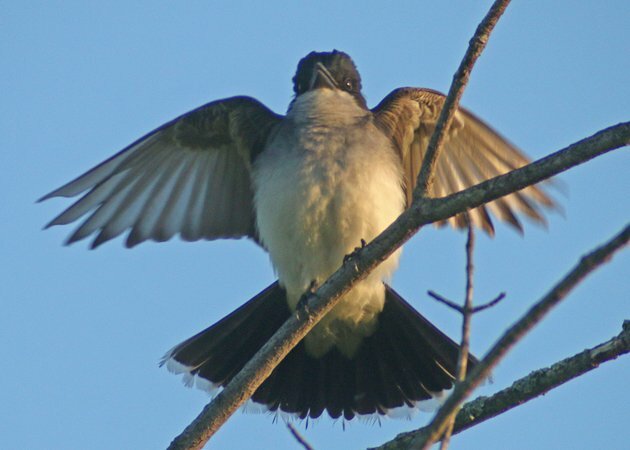 I esp like that kingbird at the moment of flight. Where Are You Birding This Fourth Weekend of April 2014?